Last year my brother, Mike, built a 3D printer for his computer. He is a computer wizkid and my go to guy if ever I have any problems with my computer. 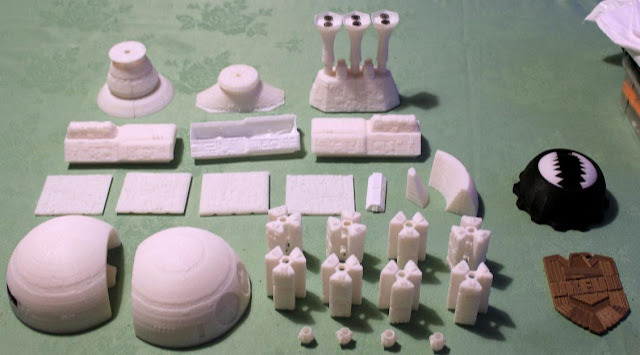 Anyway, one of the first things he wanted to make with his 3D printer was a model of the starship Discovery from the film, 2001, A Space Odyssey. This was a major undertaking that would take a very long time to make. He made good progress but when he went to replace the printer spool he was using to build it he found that it was no longer available for sale. So he switched to another manufacturer's printer spool and discovered it was much, much better than the one he was originally using. The surface detail was much sharper and by then he had learned how to save time with his build and to make it more efficiently. At this point he had two choices - continue on with the build or start afresh. We discussed this and both agreed it would be wisest to start afresh so that the model would be consistent in its uniformity. So, what to do with the parts he'd already made? That proved to be an easy decision. I offered to take the parts he'd made off him and use them as scenery items in my Judge Dredd Miniatures Game campaign. Just looking at them, I could see so many possibilities. So just last week, when Mike came to visit me during the Easter holidays (he lives in Preston and I live on the opposite side of the country in Gateshead), he brought all the pieces for me... plus a few extras. This photo above shows everything he brought over. The two items at the far right are not parts of the Discovery model. I'll tell you about them shortly. The two half sections that made up the front dome of the Discovery when put together in the above configuration looks just like some sort of small 28mm scale hab-zone building. These components could be used as storage units or support pillars. I haven't yet decided if I'm going to leave them as is or use the connector rings to make four double height units. At the top left is a component that could sit on a building's roof perhaps as a sensor array. The three booster engines would make great high tech chimneys. The hollowed out section in the middle row could be used as the body of a transport vehicle but will need a few more components to make it work. It's a conversion I could do. Or I might use it as a wall panel with the hollowed part facing inwards. That's what I plan for the long solid section to the right of it and the other items. The two curved sections will be used as barriers. Here is more square wall panels and in the top left corner another roof item, possibly a lookout bay. It goes without saying that I will be painting all of these items. One of the two non-Discovery items that Mike made for me was a Judge Dredd badge. This was such a nice surprise. Mike knows that I am a huge Judge Dredd fan. The other item is one of the very first things he made with his 3D printer. It's high tech bear trap like device and yes, it is a working a model. By twisting the base clockwise or anti-clockwise you can open or close the white jaws. I can see so many possibilities for using this. It could be used as a high-tech trap or the doors to a missile launch facility or some kind of an airlock. This is what Mike had to say about it - "Total length is around 1100mm – I bought a 1000mm metal rod but it doesn’t go right to the ends of the sphere front and boosters back. 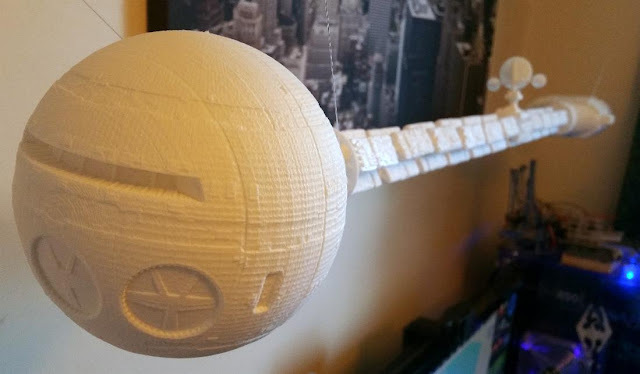 I look at it and think it’s amazing that it came from nothing – it wasn’t like a model kit - I printed it from a very small (7.61Mb) CAD file and I take my hat off to the guy that modelled it. I also love how it’s free on Thingiverse. I reckon it probably cost me between £12 to £15 in materials, so very cheap for what it is. I downloaded the file about a year before my printer was finished so I always knew it would be one of the first prints. 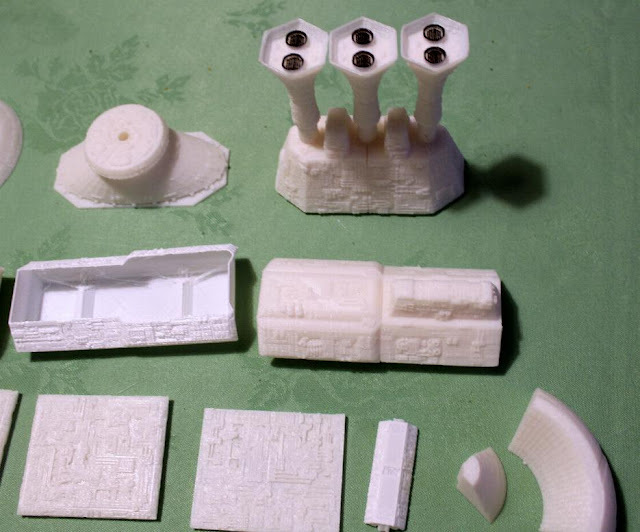 I estimate the plastic parts to be around 650 grams in weight and it takes roughly 1 hour per 10 grams to print, so about 65 hours in total." The possibilities for the future are incredible. 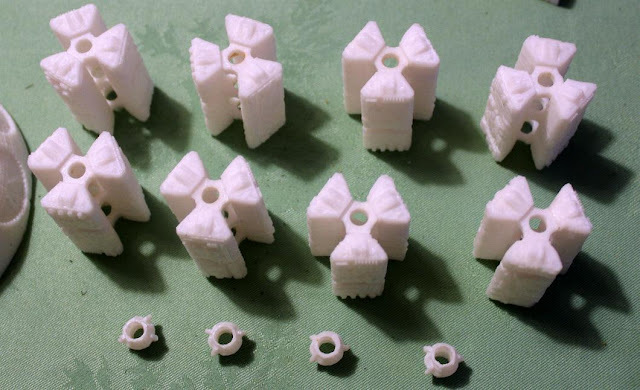 3D printing is here to stay and is going to be a major part in the future of gaming. So much is already available and I'm very excited about 3D printing. It can only get better and more affordable. The finished model is very impressive and I'm sure your right Bryan 3D printing is here to stay and can only get better. I'm not a massive fan - yet! But it is getting there. I'm not really a 2001 fan but these printers are great. On Starship Modeller and Matakishi's Tea House the things they make are great.Star Destroyers, statues, crates. Endless fun but out of my area of expertise. I've a large enough plastic and lead mountain to paint. Ha, ha, tell me about it, Phil! I'm exactly the same... but how could I turn down freebies like these? Quite right, Dave. 3D printing is here to stay and will only get bigger, better and cheaper. Some very interesting and very useful projects there. 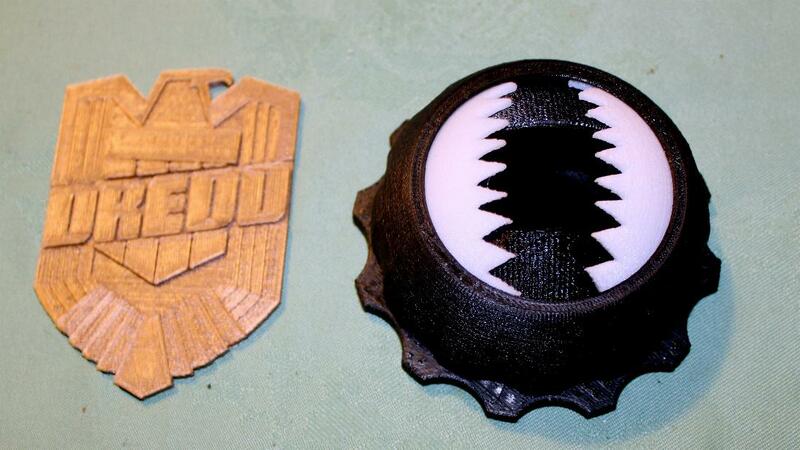 I can see individual JD badges being made ..... Judge Scott as opposed to Judge Dredd! 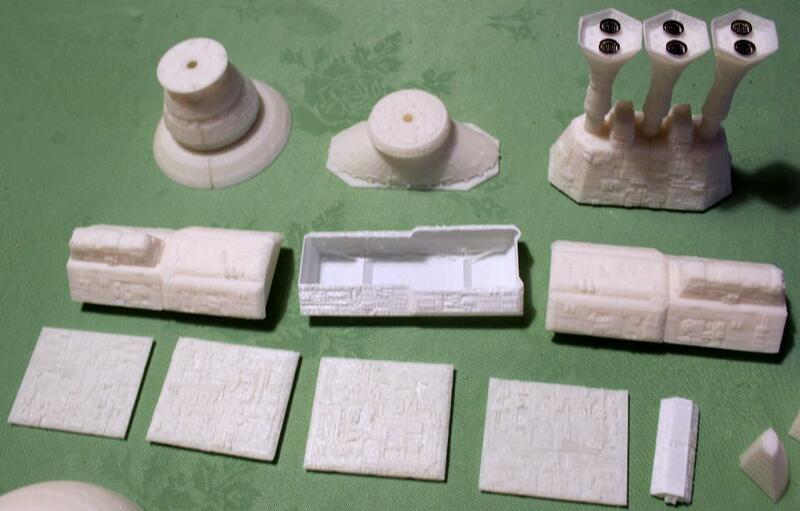 And loads of ideas for terrain. Many thanks, Clint. I'll have a chat with Mike about getting a Judge Scott badge made. The finished pieces are just great and the cast-offs are perfect for my JDMG campaign. Mikie tells me he can alter the name on the badge - woohoo! Actually, Dave, I was thinking of getting badges made for you, Andy, Clint, Roger and Simon and sending them off to you as gifts for being so supportive of my JDMG campaign. I just need to see how my Judge Scott badge turns out first, but I have high hopes, because my brother is a computer genius! You may have made your comment in jest but it is something I am seriously thinking about. Wow that would be awesome, I'd have to wear my badge with pride all the time. Thanks, Simon. As soon as I get them painted they will be appearing in upcoming JDMG batreps. I would love to see your Doomsday Machine. It sounds fascinating. What a cool looking miniature Bryan. It will be interesting to see it painted.